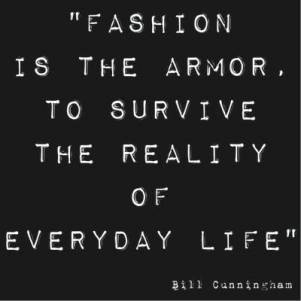 It seems only fitting that one of L'Wren Scott's last posts on Instagram was this quote from Bill Cunningham, the NY Times photographer who has championed the concept of street style for the last thirty years or more. Before it became ubiquitous mind you. Bill pioneered the concept. Like L'Wren, Bill came from humble working class beginnings before gaining widespread fame and notoriety in the fashion industry for his talent, his eye and finally, of course, his eccentricities. Unlike Simon Doonan's pessimistic theory - in his recent book The Asylum (which I found otherwise hilarious and charming) - that 'chic ultimately = bitchiness' (Obviously, I've simplified what he wrote big time. ), Bill's quote reveals the fragility and vulnerability that lurks in the hearts of the stylish, the stylishly eccentric and quite possibly, everyone else in between.